These days, going into someone’s home and finding a rabbit is as commonplace as finding a regular cat or dog. I’m tempted to say that house rabbits are a new craze but I would be wrong. 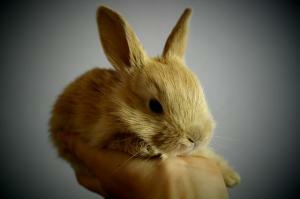 For as long as people have kept and cared for rabbits, there has been an interest in having them indoors. Here they are better protected from the dangers of outdoor-living and closer contact with their humans, can develop them into the very best companions! In fact, some even claim that rabbits make better companion pets than cats and dogs because of their lively and entertaining natures. So, why a house rabbit? If you are considering becoming a bunny parent, think twice about where you house it. My rabbit lived to the grand old age of twelve and spent her entire life outside. Day and night, Lilly had full access to the outdoors in the spacious confines of a secure enclosure; even though she had a perfectly warm and sheltered hutch to sleep in at night, the open door onto a patch of lawn was always too much of a temptation for her and many a morning, we found her dozing outside. In her twelve years of life, Lilly never put a paw inside the house and yet was perfectly content and healthy. I realise I might have got lucky with this. I have heard many horror stories about outdoor rabbits being attacked by predators or very literally scared to death, to have me understand the appeal of a house rabbit. Not only are they thought to live twice as long as rabbits housed outside, but their quality of life is probably much better when you think of the warmth, comfort and companionship they enjoy on the inside! Attacks, weather-related illnesses and serious diseases such as Myxomatosis are encountered far less inside than out. Something else to bear in mind is that rabbits are social creatures that can get very lonely on their own; keeping a bunny inside with you is therefore far better than leaving it to its own devices in a cold outdoor hutch. Think about getting a bunny playmate as rabbits love the company of their own kind. They are also very compatible with other domestic pets like cats and dogs, providing that both parties are introduced to one another gradually, so they can adjust to the indoor setting well. Of course, interactions between animals should always be supervised, especially in the early days when your pets are first getting to know each other. More importantly for the proud home-owner, rabbits can easily be litter trained. They are fastidious creatures when it comes to where they go to the toilet so providing an inviting place for them to pay their visits will ensure a litter-free environment is kept elsewhere. Also, rabbits probably spend more of their day grooming themselves than we do, so actually, their odours are kept to a minimum! VioVet stocks a range of litter trays that are suitable for cats and rabbits, as well as specially designed corner trays and litters for small animals. Do house rabbits cost more than outdoor rabbits? Both house rabbits and outdoor rabbits require the same amount of love, care and attention. As said, they are social creatures that do not cope well on their own. Even if you have several rabbits together in an outdoor enclosure, they still need to experience regular interaction with their human. They still need to be fed a quality diet, given fresh water and plentiful space to play and exercise, and taken to the vet's for yearly check-ups. This is no different for house rabbits that spend their time indoors, whether alone or with other animals. They crave company so are not well suited to households whose humans work long hours or are regularly away from home. When it comes to estimating the costs of caring for a rabbit, known expenses like food, bedding, toys and treats are easy enough to keep on top of, but it is the unexpected costs (i.e. veterinary bills) that are a setback for any pet owner. Injuries can occur inside and out, with some requiring medical attention. While foxes and disease are the biggest threats to rabbits housed outside, (they need a combined vaccination- Myxomatosis and Rabbit Haemorrhagic Disease (RHD), which can cost about £40 on average) house rabbits are not impervious to problems of their own (electrocution, being one of them). Whether housed inside or out, rabbits require this annual vaccination. As we know, rabbits love to chew. They also love to dig and will burrow their way into just about anything given half the chance. Your garden is the perfect place for a rabbit to indulge in these instincts and pleasures, without causing too much damage. But in the home, this is a different story. Chewing furniture and fabrics is hardly desirable and, whilst rabbits are trainable, they are harder to condition than cats and dogs. House rabbits can be a law unto themselves and will chew as they please; because of this, the only real method of defence is bunny-proofing your home. How do I bunny-proof my home? There are many indoor hazards to take care of before bringing a rabbit inside. While this goes for any pet, rabbits are more likely to encounter problems because they are small, can access just about anything and anywhere and have an insatiable desire to chew. With electrical cables around, it is important to inhibit this behaviour as much as possible to avoid your rabbit getting burned or electrocuted. All power cables that are in reach of your pet need to be covered; split-length cable tubing can be bought cheaply to put around electrical wires leading from your tv, mobile charger and games console. If you think these might be impervious to the attentions of your rabbit, it is worth considering an alternative. Plastic wall conduits are a more robust measure for storing electrical cables out of sight of your rabbit. These flat, box-like coverings run the cables up the wall so that your pet cannot reach them with its claws and teeth. It can also be useful moving heavy furniture in front of plug sockets to keep your animal away, however, rabbits are curious animals that will spare no effort in accessing 'out of bounds' areas. Keeping games consoles and other electrical appliances in a bunny-proof cabinet when they are not in use is vital for the safety of your pet. Also, if you leave the house, make sure these appliances are not left lying around for your rabbit to find. Hair dryers and mobile chargers are often left out after use and it is part of responsible house rabbit ownership to consciously put these away. Providing alternative chew things can work as a distraction for indoor rabbits, encouraging them to gnaw on something safe and suitable. VioVet sells a great selection of durable chew toys for your rabbit's enjoyment. Other indoor hazards include house plants and flowers - tulips, poinsettias, holly and tomato leaves (amongst others) are all toxic to rabbits and need to be kept out of their reach. Care should always be taken with sharp kitchen items in terms of where they are stored and how they are used with house rabbits in the vicinity. Otherwise, the majority of indoor hazards relate to the unfortunate damage done by your rabbits to your home. Anything wooden is worth protecting, as this is possibly a rabbit's favourite material to gnaw. Chair and table legs, the bottom of wardrobes, skirting boards - you name it, your rabbit will be interested in chewing it! When it comes to protecting these items, some are easier than others to cover. Furniture legs can be easily wrapped in sticky tape, cardboard or bubble wrap to prevent damage from unwanted gnawing, while skirting boards will require more attention. Some of the most dedicated house rabbits have been known to scramble beneath sofas and armchairs and burrow their way into the soft underlining without being noticed. Obviously, this causes a lot of damage that can be costly to repair. To stop this from happening, cover the bottom of the furniture piece with a flat piece of cardboard so that your rabbit can't crawl inside. This won't be seen by anyone, and only you and your bunny will know it's there. Lastly, make sure fragile items are not left on surfaces that your rabbit is likely to jump onto. Mugs, vases, photo frames, ornaments and lamps are all at risk of being toppled by active bunnies so keep these up high or use double-sided sticky pads to secure them down. If you are particularly worried, close off the room altogether so your rabbit can't harm what's inside. Many people with house rabbits contain their animals to certain areas and rooms anyway, so don't feel bad if your bunny isn't given full reign of the house! If you take care where you leave things and make sure hazards are reduced as much as possible, there is no reason why you can't enjoy the company of a rabbit, or several, in your home. It doesn't have to be one or the other and being a house rabbit doesn't mean it can't also venture outside. In fact, fresh air and exercise is good for rabbits and should be encouraged! Cat flaps that allow your rabbit to come-and-go (as long as it's within a secured outdoor space) are ideal as they grant your bunny the freedom to move and explore both sides of the wall.